Took a peek at the 'net this afternoon, and couldn't resist posting this one. 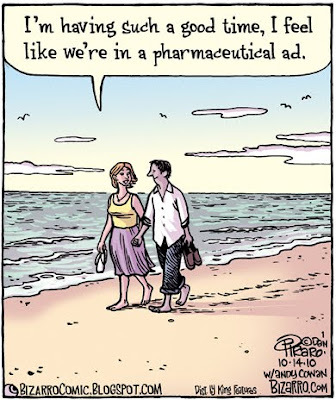 (Not advocating the advice; just recognizing the sentiment). It's been a long time since I've had a proper vacation from blogging. I'm going to use this next week to carve pumpkins, watch football, eat leftover Halloween treats, and reconnect with family. I'll see you-all in early November. 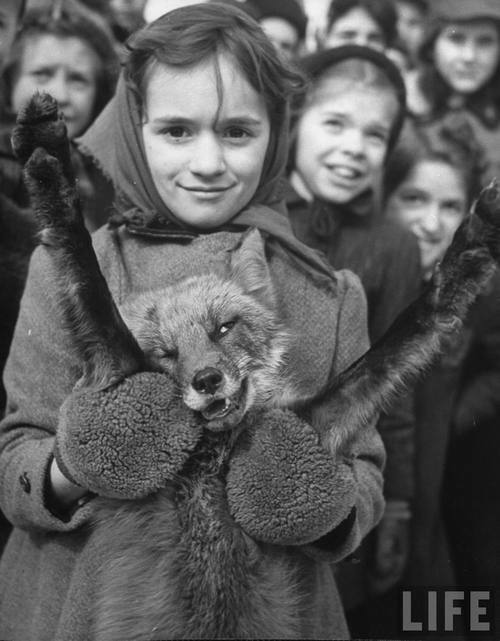 There are so many fantastic photos that I would like to embed the entire lot. I've selected just a few; the others can be viewed at Nikon's homepage, a gallery at The Guardian, or at Boston.com's The Big Picture. At the time he was hit, Berry had with him a backpack that contained bolt cutters, Garcia said. Berry and a Quicksilver Express Courier delivery truck were southbound on 1st Avenue when the truck turned right, striking the cyclist while he was in a designated bike lane on the right side of the road, police said. Berry's criminal history in Minnesota includes convictions stretching back to 1996 for burglary, domestic abuse, drunken driving, disorderly conduct and assault. I was going to add a wry comment re karma, but have read that the term should not be used too lightly. Everyone in the Upper Midwest has been talking about the "land hurricane" that has swept the area for the past several days. I won't repeat any of the stories, which you have either heard or don't care about. 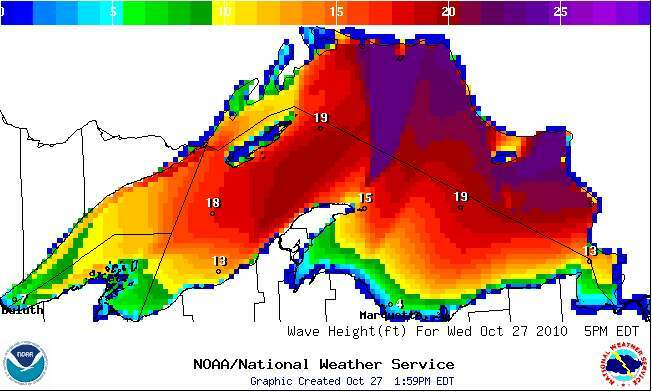 But I thought the graphic of wave height on Lake Superior, from NOAA, is interesting. The winds today are coming from the south and west, so with that long fetch over the lake, the red and purple colors near the Canadian side indicate waves 20-25' high! (I presume these data reflect computer modelling rather than actual measurements since the timestamp is later today). I read in one comment thread that every ore boat has been pulled off the lake into harbor to prevent another incident like the Edmund Fitzgerald (Gordon Lightfoot song in an excellent video at the link). You can check your name (and the top 100 girls' names) at The Office for National Statistics, or (while it's up) at The Guardian. Mongolia is full of interesting and beautiful places. In the central region, along the Tamir river stands the Taikhar chuluu. This is a huge rock, there is nothing similar in the neighborhood. The stone itself is not as interesting as the inscriptions on it and the legends connected with it. Long time ago the rock was called dai gürü. Dai is a Chinese loan-word (大) meaning big, while gürü means rock in Mongolian. 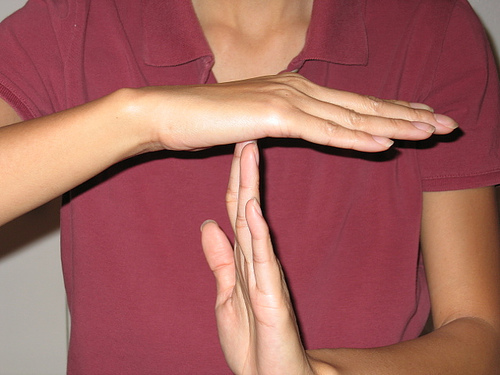 The modern name Taikhar is a compound of these two words (the changes d>t and g>k are absolutely normal in Mongolian, and a similar change of vowels is also acceptable). Therefore it is unnecessary to add to the name chuluu which means ‘stone’, because this would mean something like “Big rock rock” (as if one said “CD disk”). The rock has a large number of inscriptions. Unfortunately, our contemporaries also leave their scraps on it, and as a consequence several old inscriptions are disappearing. Among the graffitis there are many very old ones, some written in the Turkic age [A.D. 6th century]. 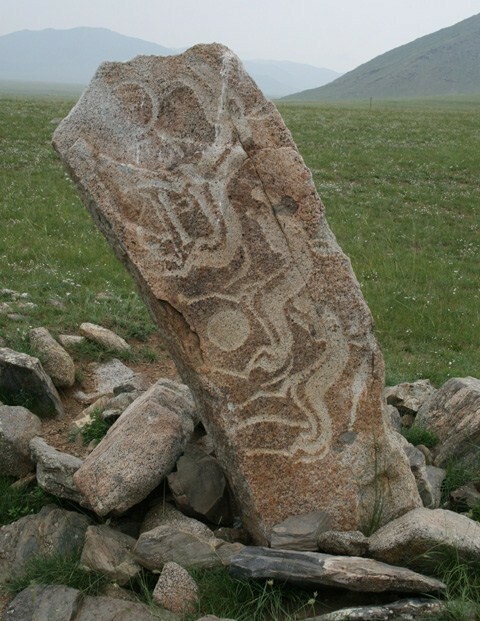 The Turkic inscriptions are not just epigraphic relics, their importance goes far beyond this. In fact, they attest that the rock was revered already in the Turkic period, and this tradition was uninterruptedly transferred to the Mongols. Thus the Turkic, Mongolian and other inscriptions prove the cultural relations and continuity between the various people following each other. 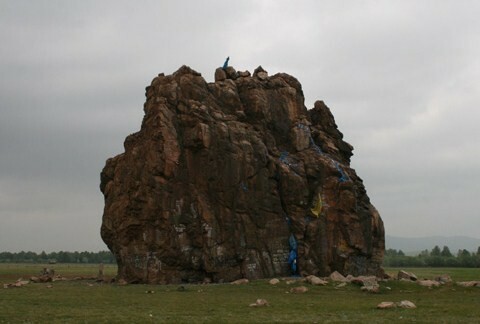 There are several Mongolian inscriptions on the rock, unfortunately the majority are near to illegibility. I can not present you a large inscription, simply because I could not decypher any longer one. However, I can show two shorter one. 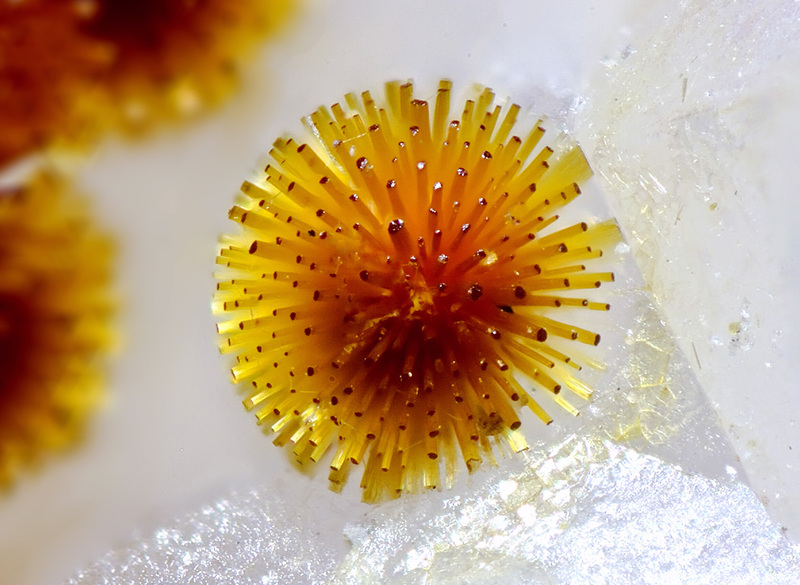 They are not very exciting, but are worth a look. Beginning of the inscription: oṃ sayin amuγulang boltuγai, that is: “Om, let there be peace!” I cannot completely understand the continuation of the text. Another inscription: qamuγ amitan burqan-u qutuγ olqu boltuγai, that is: “May every living being reach the holiness of the Buddha!” These two short examples attst that the cult of the place continued after the arrival of Buddhism. This is also documented by a large number of Tibetan graffitis on the rock. Of course, the rock itself did not come here by itself, the legend says. Long time ago there lived a hero here called Bökebilig (“Strong and wise”). Suddenly a large snake started to come out from under the earth. Bökebilig did not like this, and he pushed back the snake from where it came, and then he closed the mouth of its cave with this rock which has been standing here ever since. Not far from the rock there is a small mountain called Altan sandali (“Golden throne”), of which tradition says that Bökebilig took a rest on it, while washing his hands in the nearby Tamir river. Once you’re here, check the nearby graves with a number of so-called “deer stones”. They indicate that there was no cultural continuity between the original people erecting the “deer stones” and the later one digging the graves, because the “deer stones” were simply used for building material. As their name shows, “deer stones” were mostly decorated with deers, but on a grave near Altan sandali we could also find a very special stone with horses instead of deers. Fortunately, it has survived the centuries in an excellent condition. Here you are. There are only a handful of “horse stones” around, while you can still see hundreds of “deer stones”. It is still a question why these stones were carved and erected. Perhaps we will resolve this mystery on a day, but one thing is sure: it is worth looking around in Mongolia! I find this whole subject fascinating. The rock itself doesn't look to me like a glacial erratic; perhaps some reader here can provide an opinion re its formation. Regarding the history that it was used by a giant to crush a snake when the ground began to move in waves, I wonder if this part of the world is seismically active. The petroglyphs are elaborate and beautiful; there are additional photos of them and of the ancient epigraphs at mongγol bičig & manju bithe. A hat tip to "Studiolum" at Poemas del rio Wang for locating this interesting item and providing the translation. 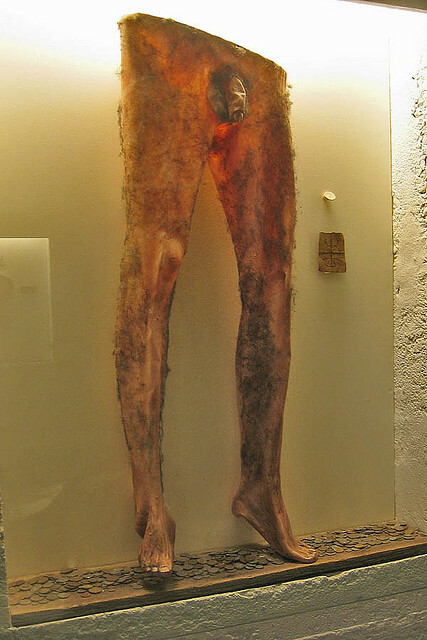 If you want to make your own necropants (literally; nábrók) you have to get permission from a living man to use his skin after he's dead. I suppose it's reassuring to note that sorcerers in Icelandic folklore got informed consent before flaying a dead person's corpse. But I think I see a trick in the guarantee: the scrotum will never be empty as long as the original coin is not removed. Well, duh (perhaps some subtlety has been lost in translation). Text from the website of the Museum of Icelandic Sorcery and Witchcraft, via Got Medieval. Photo via Flickr user HelenPaisson of a latex reproduction housed in the aforementioned museum. Although there is evidence that there were Norias around the city during the Byzantine era which ended in 1453, the Norias of Hama date from the a little later. It is thought that they were started in the Ayyubid dynasty in around the twelfth century and enlarged in the Mamluk era of the fourteenth. Above photo from Wikimedia; there are numerous others at the Kuriositas link. "Fox Atlanta set up secret cameras inside 5 different hotel chains from the Holiday Inn to the Ritz Carlton and caught every single one of them failing to properly wash the room's glasses. At every single hotel, regardless of price, the glasses were simply rinsed out and left for the next guest. Some hotels used dirty bath towels to wipe the glasses. One hotel employee rinsed the glasses after cleaning the toilet—using the same gloves." The value of "dirty jobs"
Excerpts from an interview with Mike Rowe, who hosts the Discovery Channel's "Dirty Jobs." MIKE ROWE: Attitudes toward hard work have changed, and not for the better. Many people view dirty jobbers with a mix of pity and derision. Some ignore them altogether. However, one thing is unchanged: People with dirty jobs make civilized life possible for the rest of us. For that reason, I see a willingness to get dirty as a mark of character. G: Why don’t more people respect dirty jobs? There is nothing wrong with getting a college degree. 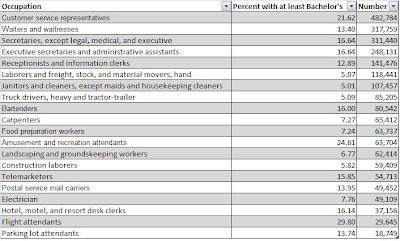 The flaw in our character is our insistence on separating blue-collar jobs from white-collar jobs, and encouraging one form of education over another. Why do we value one above the other, when our future depends upon both? 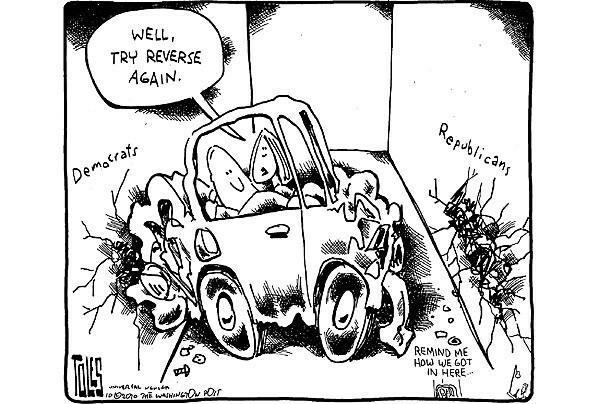 That’s our blind spot. My own dirtiest jobs were greasing cooker machines in a Green Giant canning plant, and cleaning bedpans (and buttocks) as an orderly. After that I spent many years teaching in the technical institute affiliated with the University of Kentucky, and I can guarantee you that the students there went on to careers just as satisfying and probably just as well-paying as most of their counterparts in the four-year degree program. 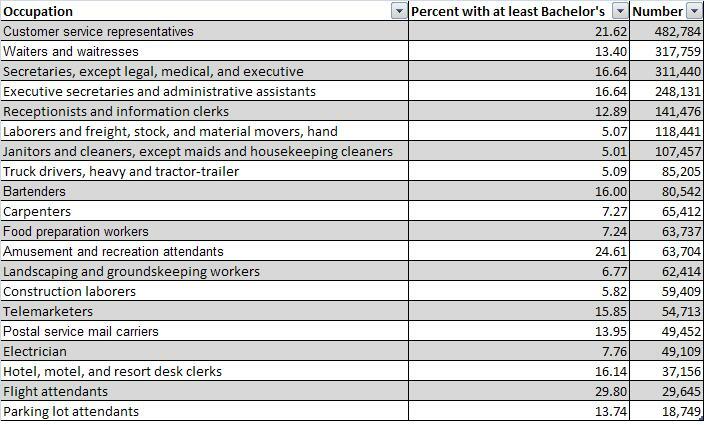 Via Reddit, where there is a long discussion thread about the value of college and of manual labor. Little Librarian is the first personal library kit made just for kids! It encourages reading and is powered by creativity and imagination, not batteries! Little Librarian provides book lovers with everything they need to transform their book collection into a library. Kids can practice the important skills of organizing, sharing, borrowing, and returning. Book pockets, check out cards, library cards, and bookmarks are just like the ones from the real library. Little Librarians will issue overdue notices and awards. Favorite books can be stored in the reading journal and shared with friends. A real product, available through booksellers linked at the Little Librarian site, via The Centered Librarian. 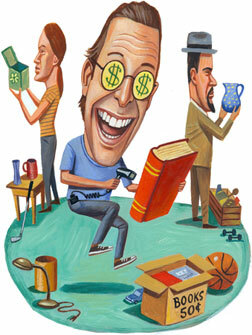 I see guys like this at our library's monthly used-book sales. As fast as lightning, they pull books off the shelves, scan them and toss them into their huge baskets. I find the entire process annoying, but it is of course quite legal and not really unethical. Just annoying. More details at the link. This man demonstrates a technique used in Malaysia. Found at Anything and Everything, via Neatorama. How it works Thieves look for gift cards that are displayed on grab-and-go racks, such as in grocery and department stores. They use a handheld scanner—which you can buy online for just a few hundred dollars—to read the code behind the magnetic or scratch-off strip on the back of the card. That, combined with the card number on the front, gives them everything they need to steal the value of the card. Then they put the card back on the rack. Later an unsuspecting buyer purchases the worthless gift card. Even if a card isn't preloaded, a thief can steal the card number and security code, then call the 800 number shown on the card every few days to check the balance. Once a shopper has purchased the card and loaded it with a dollar amount, the thief can spend it before the purchaser does. Prevent it Buy cards that are behind a customer-service desk... Inspect the card; if the magnetic or peel-off strip on the back isn't pristine, the card might have been tampered with. When buying a preloaded card, ask the cashier to scan it to make sure the full value is on it. If you're buying from a third-party gift-card site, look at the refund policy. And always hang on to the receipts. If something goes wrong, it can help you—or the gift recipient—get a refund. From Yahoo! Shopping, which has additional tips. Most American Jews accept such stories as fact. The truth, however, is that they’re fiction. Ellis Island, New York City’s historic immigrant-absorption center, processed up to 11,000 immigrants daily between 1892 and 1924. Yet despite this incessant flow of newcomers, the highest standards of professionalism were demanded of those who worked there. All inspectors—many of whom were themselves immigrants, or children of immigrants — were required to know at least two languages; many knew far more, and all at the native-speaker level. Add to that the hundreds of auxiliary interpreters, and together you’ve covered nearly every possible language one might hear at Ellis Island. Yiddish, Russian, and Polish, in this context, were a piece of cake. Nor were inspections the brief interactions we associate with passport control in today’s airports. Generally they lasted twenty minutes or more, as inspectors sought to identify those at high risk of becoming wards of the state. But perhaps most significantly, Ellis Island officers never wrote down immigrants’ names. Instead, they worked from ships’ manifests, which were themselves compiled by local officials at the point of embarkation. Even overseas, passenger lists were likewise not generated simply by asking immigrants for their names. Rather, they were drawn from passports, exit visas, and other identification papers. The reason for this was simple: Errors cost the shipping company money. A mistake on a manifest, such as a name that was not corroborated by other documentation (whether legal or fraudulent), would result in the forced deportation of the person in question back to his point of departure—at the shipping company’s expense. Of course, many Jewish immigrants’ names were changed upon coming to America. Without exception, however, they changed their names themselves. The rest of the (long) story is at Azure, which "presents the best in Jewish thought from Israel and around the world." "Life is like a B-grade movie..."
Quote found at The New Shelton wet/dry. 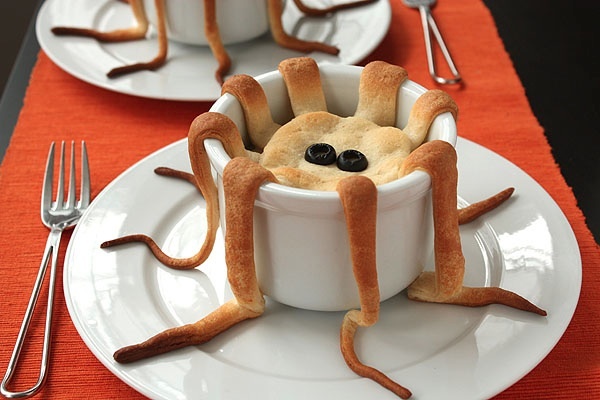 From the intriguingly named blog, Not Martha, comes this whimsical concoction. Via Laughing Squid. So, the military appear to warned these hikers re the danger they would encounter, and concluded that they had an intent to agitate and create publicity regarding international policies on Iran. "Morning Joe" is vehement: "We are not at war with Islam. We are not at war with Muslims. We are not at war with Afghanistan. We are not at war with Iraq, Iran - it's nonsense..." He excoriates the political and media world for not clarifying that the only ones who have ever attacked us are a small group of radical militants in Saudi Arabia." The Berners Street Hoax was perpetrated by Theodore Hook in the City of Westminster, London, in 1810. Hook had made a bet with his friend, Samuel Beazley, that he could transform any house in London into the most talked-about address in a week, which he achieved by sending out 4,000 letters in the name of Mrs Tottenham, who lived at 54 Berners Street, requesting deliveries, visitors, and assistance. On 27 November, at five o’clock in the morning, a sweep arrived to sweep the chimneys of Mrs Tottenham's house. The maid who answered the door informed him that no sweep had been requested, and that his services were not required. A few moments later another sweep presented himself, then another, and another, 12 in all. After the last of the sweeps had been sent away, a fleet of carts carrying large deliveries of coal began to arrive, followed by a series of cakemakers delivering large wedding cakes, then doctors, lawyers, vicars and priests summoned to minister to someone in the house they had been told was dying. Fishmongers, shoemakers, and over a dozen pianos were among the next to appear, along with "six stout men bearing an organ". Dignitaries, including the Governor of the Bank of England, the Duke of York, the Archbishop of Canterbury and the Lord Mayor of the City of London also arrived. The narrow streets soon became severely congested with tradesmen and onlookers. Deliveries and visits continued until the early evening, bringing a large part of London to a standstill. According to the Museum of Hoaxes, Hook was never punished for this behavior. Via Reddit, where the discussion thread focuses of "crew pies" (fake pizza orders). 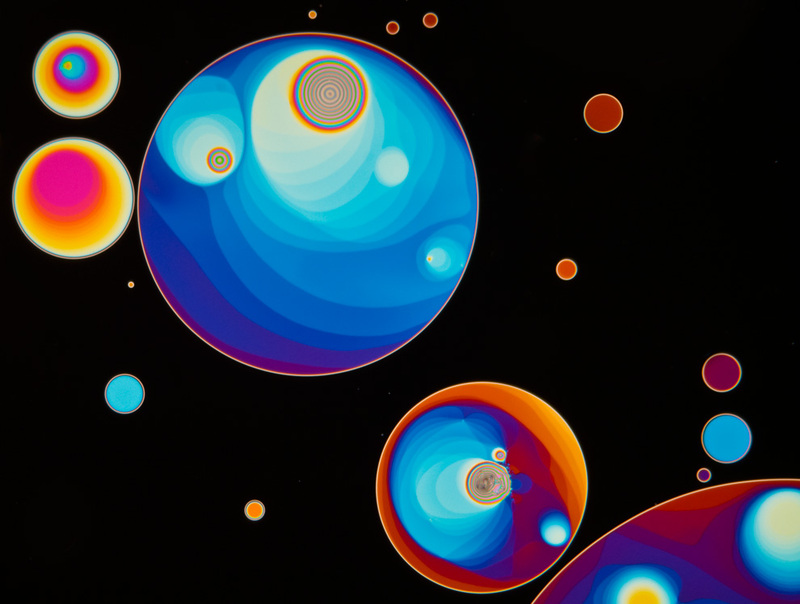 I am recurrently fascinated by morphing videos. The one above, by Philip Scott Johnson, features 60 years of television actresses on the CBS network, via Vimeo. If this interests you, see my previous posts on morphing the presidents, 500 years of women in art, and Mona Lisa descending a staircase. She is the great English novelist renowned for her polished prose, of whom it was once remarked: "Everything came finished from her pen." Yet Jane Austen couldn't spell, had no grasp of punctuation and her writing betrayed an accent straight out of The Archers, according to an Oxford University academic. Page after page was written without paragraphs, including the sparkling dialogue for which Austen is known. The manuscript for Persuasion, the only one of her novels to survive in its unedited form, looks very different from the finished product. "This suggests somebody else was heavily involved in the editing process between manuscript and printed book," Prof Sutherland said. The editor in question is believed to have been William Gifford, a poet and critic who worked for Austen's second publisher, John Murray. The rest of the story is at The Telegraph. 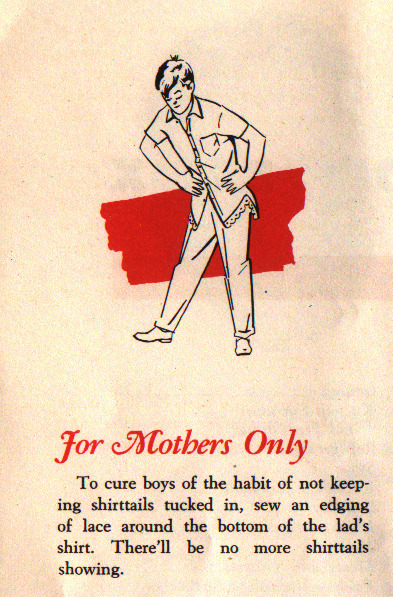 From a booklet published in the 1940s, via Centuries of Advice and Advertisements. Whoonga is cheap, bought from a dealer for just 20 rand or $3 a hit. But 40 per cent of all South Africans survive on little more than $2 a day... Worst of all, it means people in need of ARVs to save or prolong their lives are sometimes going without. They're being mugged for their pills as they leave the clinic. One group is making a difference, albeit a tiny one. Vumani Gwala runs Project Whoonga, a community support group operating in one small corner of a giant township outside Durban called Kwadebeka, where whoonga thrives and grows every day. There are no figures available yet for the scale of whoonga use, but Gwala estimates it's easily in the several thousands in Kwadebeka alone. Project Whoonga needs all the help it can get. Contact them at www.whoonga.za.org. 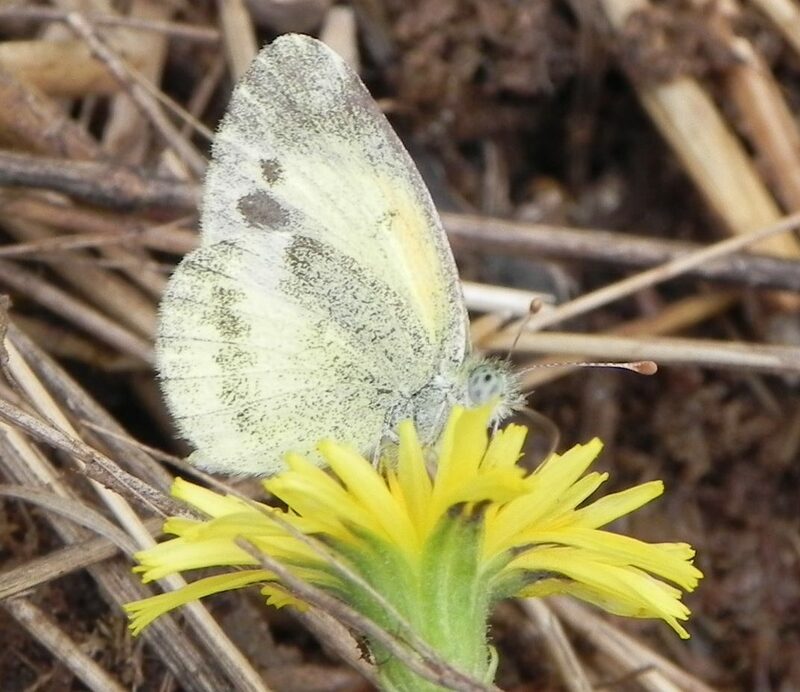 If it were not for collectors England would be full, so to speak, of rare birds and wonderful butterflies, strange flowers and a thousand interesting things. But happily the collector prevents all that, either killing with his own hands or, by buying extravagantly, procuring people of the lower classes to kill such eccentricities as appear. 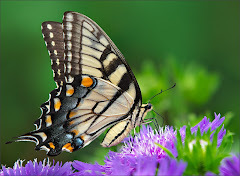 Modern sensibilities are, of course, that butterflies should be collected only as digital images. Economic realities are apparently a different matter in Cambodia. Wells quote via The Project Gutenberg Project. A pitched battle is not a chance encounter such as a skirmish, or where one side is forced to fight at a time not of their choosing such as happens in a siege. For example, the first pitched battle of the English Civil War was fought when the Royalists chose to move off an escarpment to a less advantageous position so that the Parliamentarians would be willing to fight the Battle of Edgehill. In contrast the Battle of Gettysburg, fought during the American Civil War, started by chance as a skirmish, but as both generals chose to reinforce their positions instead of disengaging, they turned what was initially a skirmish into a pitched battle. My family's ties to St. Olaf go back all the way to the school's founding, when my great-grandfather Ole Knut Finseth was one of three farmers who signed of the Articles of Incorporation of the college in 1875. As a youngster I visited with my uncles on many occasions for homecoming football games and marveled at the beautiful campus and the pretty girls who went to school there, but when my own college decision time came, I headed east. 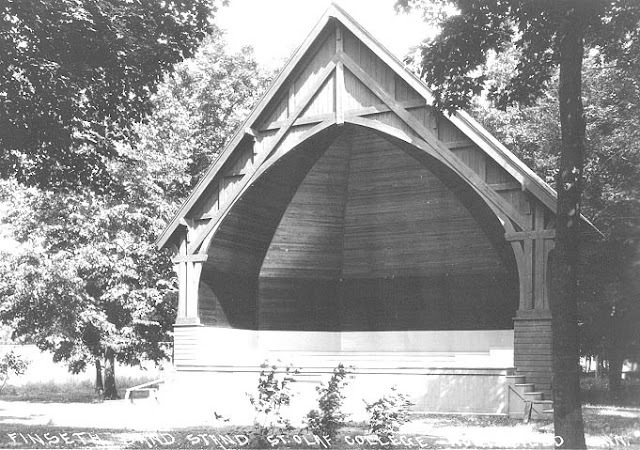 "Built in the summer of 1910 Marcus B. Finseth paid 1/3 toward this Band Stand. I paid for Victor's part and mine. Material and labor was reasonable then near 40 cent per hour. It will be improved on this year or next 1961. Total cost was $1250." 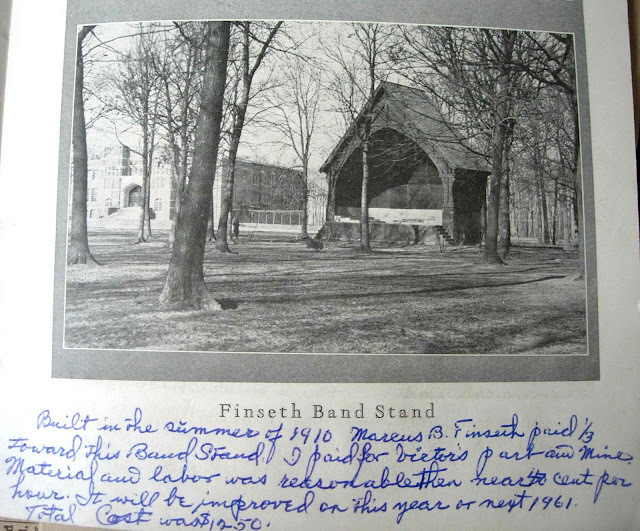 How romantic the spring open-air band concerts in the Finseth bandstand were. Ida Marvick always sang two songs on such occasions, and we thrilled to her lovely voice. It seems to me that the moon always shone during those concerts. The air was full of springtime and the moonlight made soft patterns on the grass. We girls usually had a boy friend hovering near so that real romance filled our hearts. Lovely evenings they were. This second photo shows more detail of the band stand, including the fine (Norwegian) woodcraft. Shaw's history of St. Olaf (cited in footnote) notes that when Crown Prince Olaf of Norway visited the college in 1939, they were welcomed to the campus by a program at the bandstand. A less reverent employment of the stand, hardly in keeping with the piety of the donors, was the series of spring dances announced one year during the 1960s as "Sinfests at Finseth." If there are any Oles out there who can provide additional details or memories, I'd be pleased to read your comments. Addendum: Tangentially related - an article at the St. Olaf website briefly reviews the history of (the absence of) social dancing at the college (none until 1961 !). Bibliophiles will enjoy discovering that lighthouse-keepers and their families used to be provided with "travelling libraries" - prepackaged crates that would be replaced on a recurring basis. The link includes additional photos and a sample list of books. A 300-year-old pocket watch was recovered from a shipwreck, totally encrusted and corroded. But the innards were remarkably preserved and nicely shown by CT scan (video flythrough at the link). If you have ever played/enjoyed Sim City, you should see the video of "Magnasanti" - the largest city ever created and apparently the largest that can be created. If you have no interest in SimCity, just give this one a pass. Champagne has been studied scientifically, and a paper has been written documenting how best to pour champagne in order to preserve the bubbles in the liquid to optimize the pleasure of drinking it. A never-published manuscript by Dr. Seuss (“All Sorts of Sports") was recently discovered. It was very sketchily written and crudely illustrated, and it sold at auction this past week for $40,000. The three photos at the top are, as usual, unrelated to the posts. 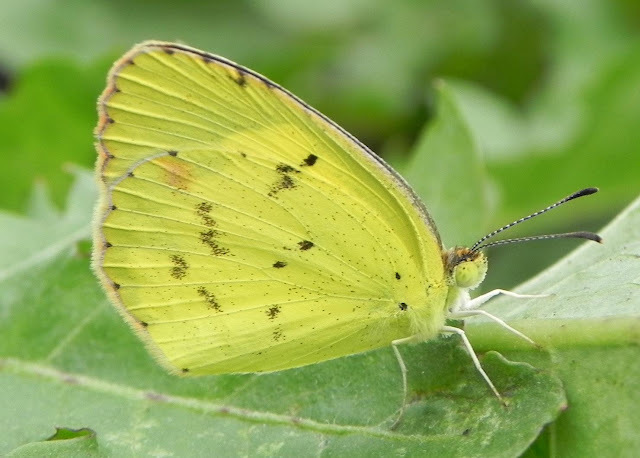 At the top is a Dainty Sulphur, and below it is a Little Yellow, two members of the Sulphur family that migrate into Wisconsin in the summer season to enjoy our weather; these were photographed during a field trip with the Southern Wisconsin Butterfly Association at the Avoca Prairie and Savannah, one of the State Natural Areas protected by the Wisconsin DNR. State Natural Areas are wonderful places to hike and photograph, but they are truly "natural" without trails and facilities, so it takes a little extra effort to reap the rewards. The bottom photo is a Monarch that was rescued from the streets of I think it was Ontario by one of the readers of this blog; the young lady who forwarded the photo to me said that "Jerry" (I think) was aerodynamically impaired, so she had been feeding it for several weeks. 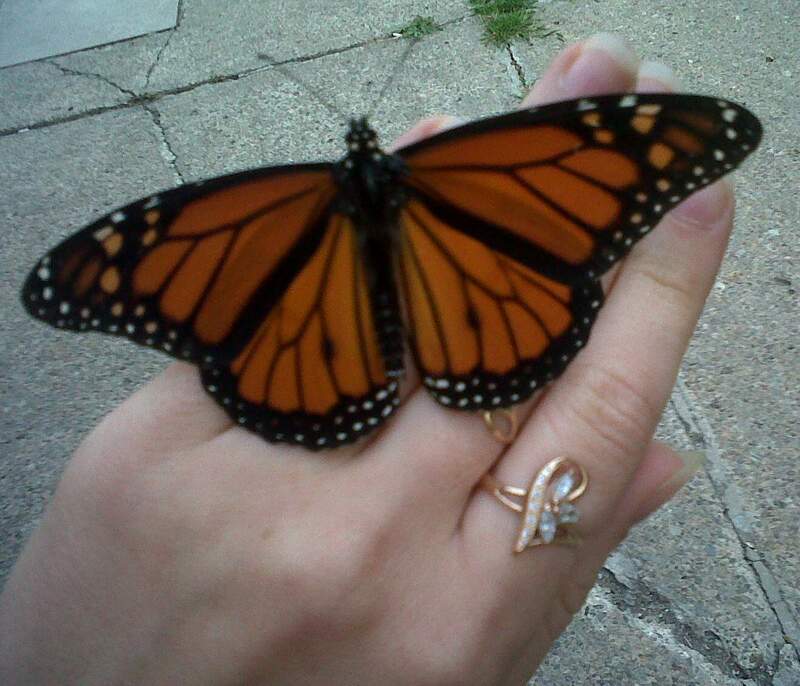 If anyone in Eastern Canada is preparing to drive down to the mountains of Mexico for the winter and would like to offer assisted migration to a Monarch, please leave a message below. In Mark Musa's translation of Dante's Purgatorio, it is noted that Lucy was admired by an undesirable suitor for her beautiful eyes. To stay chaste she plucked out her own eyes, a great sacrifice for which God gave her a pair of even more beautiful eyes. Patroclus had owned nine dogs who ate beside his table. Slitting the throats of two of them, Achilles tossed them on the pyre. But dogs weren't just sacrificed in antiquity. In Hungary, a team excavating a site in the medieval town of Kaná just outside Budapest, discovered more than 1,000 dog bones, about 12 percent of all the mammal bones at the site... Daróczi-Szabó believes that the puppies and several other dog burials at the site were intended to ward off evil, a custom that survived in Hungary into the 20th century. Further details and discussion at the Archaeology Magazine link. This issue of the magazine has a series of article on dogs in archaeology. "The maple or chestnut wood shows the distinctive curve of compass timbers -- trees grown with a bend in them for use in shipbuilding. Later crafters shaped their wood with steam, or used what's called a compound frame to piece together a hull, a practice that started around 1654..."
I read that sentence in the September-October issue of Archaeology magazine, in an article about rescue archaeology of a 17th-century wreck on North Carolina's Outer Banks. It indicated that in that era some trees were forced to grow in a curved shape. 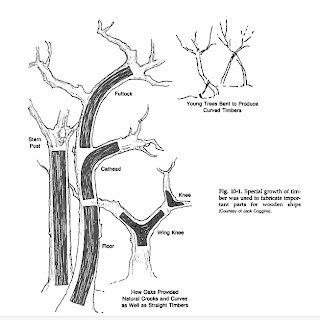 But as I read more tonight, it appears that shipbuilders could also find trees with natural curves in branches or trunks, and then harvest those for the necessary ship parts. Re restoring Old Ironsides: "While the long, straight-grained white-oak planks are used for hull planking, the live oak's large branch sections and odd shapes are required for knee supports, breasthooks in the prow, and curving "compass timbers." From a naval history website: "Oaks from the areas of Northern Europe were fine for the development of long straight planking, but the gnarled English "Hedgerow" Oak was the best for the natural curved timbers used to strengthen the ship internally. 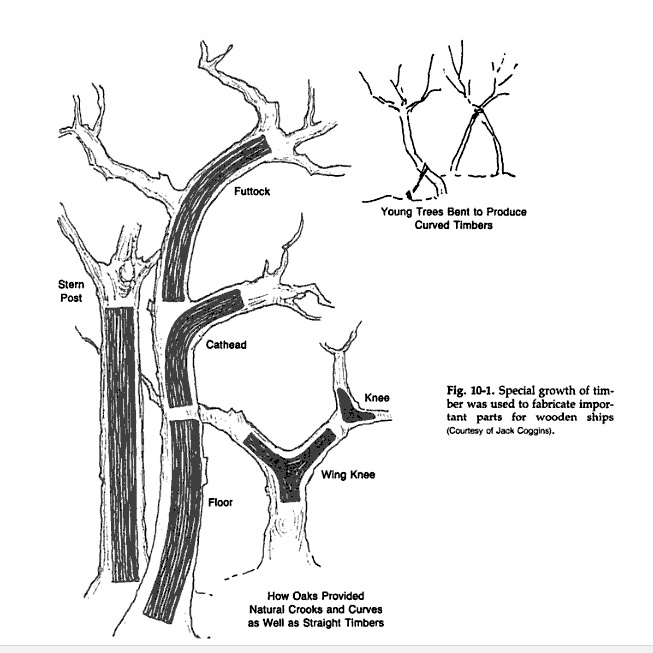 Trees were even deliberately bent in certain ways so as to " grow" a needed set of curved timbers. These curved timbers were known as "compass" timbers. And one more note - in a book about harvest Brazilian timber for the shipbuilding industry, it was noted that dense forests contain tall straight trees, while more open stands have trees with more curving branches. But also of special value were the trees that have buttressed roots (banyan-like, I suppose), because those buttresses were curved in just the way that was required for some ship parts (but required extraordinary work to harvest because not only did the tree have to be felled, but the buttress root had to be dug out of the earth). You learn something every day. The embedded image is from page 96 of Ship Modeling from Stem to Stern by Milton Roth, via Google Books. Click for bigger. Found at Treehugger. It gets more interesting at the 1:40 mark. Word for the day: "detritivore"
Everyone learns about carnivores, herbivores, and omnivores at an early age; later one hears about insectivores and piscivores. I think it was when I was playing SimLife or some similar game that I first encountered "frugivore" and "granivore." And it was not until this week while reading about some small creature that I first saw the word "detritivore." It's not a word that will be useful in everyday conversation. I think I'll save it up to use sometime when I need a good insult. 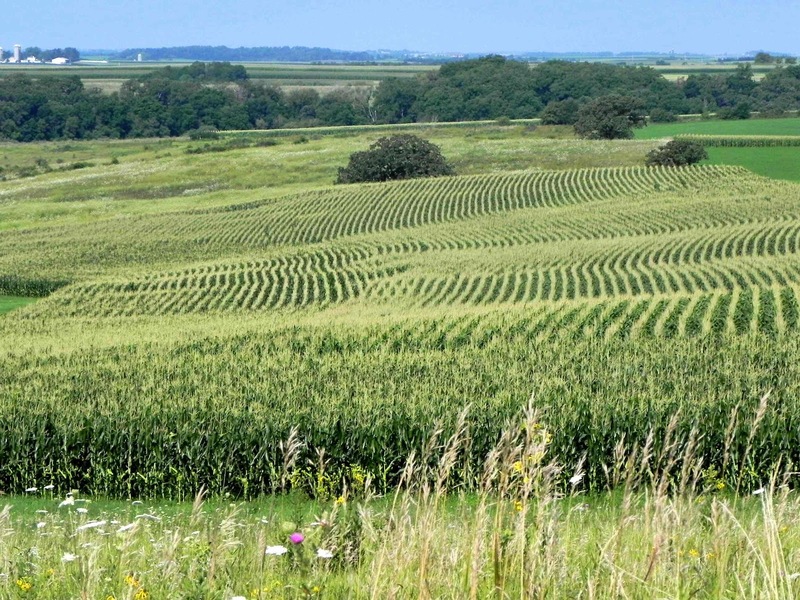 In the Upper Midwest, this is the season for corn mazes. 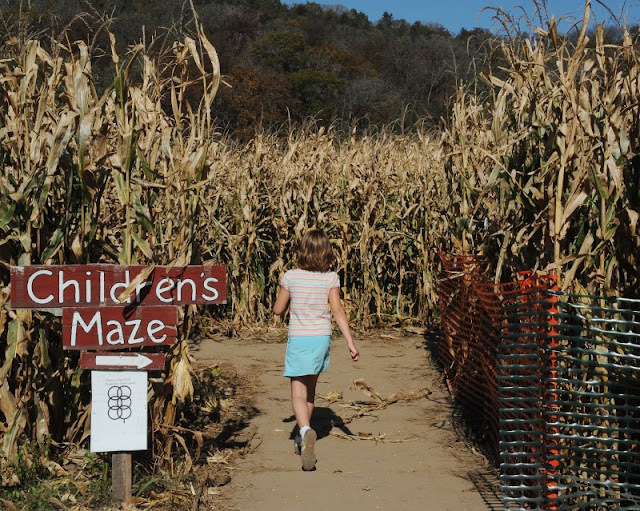 (This past weekend I also drove past a "corn maze for blondes" which I didn't photograph; you'll need to use your imagination). 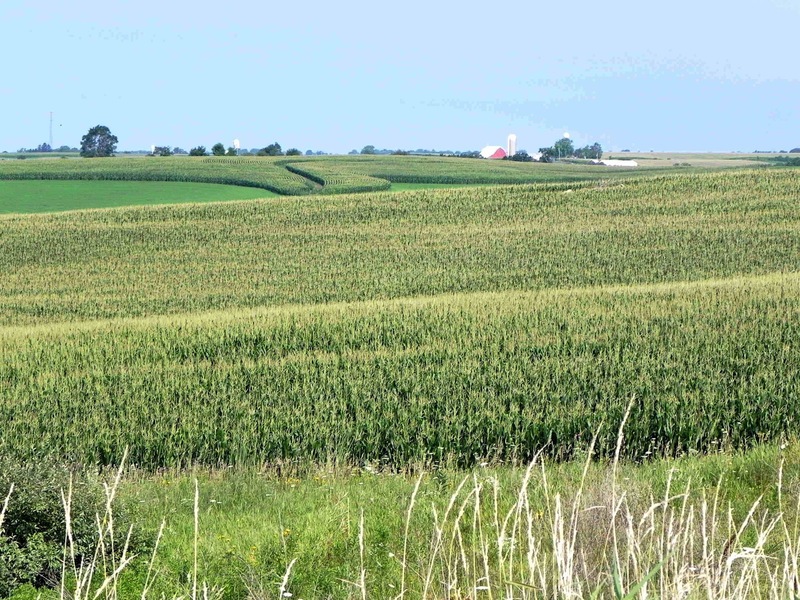 Some of my earliest memories are of the cornfields on my grandparents' farm (in one of those bright yellow southern Minnesota counties), and of walking with my dad down cornrows in southwestern Minnesota while hunting pheasants. We had two golden retrievers, neither of whom were properly trained, who when taken on a hunt for pheasants would rush down the cornrows and flush the birds hundreds of yards away, much to my father's frustration. Now in retrospect I'd like to think that Champ and Sport had a hidden agenda of warning the pheasants ("flee for your lives!"). During my years in urban Massachusetts, Texas, Kentucky, Indiana, and Missouri I didn't realize how much I missed the cornfields. Ten years ago our careers brought us back to Wisconsin, and we found a home on a dead-end street where the cul-de-sac terminates at forty acres of corn. I also see corn when I'm hiking, since many of my favorite trails abut farmland. 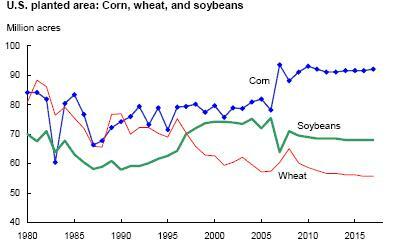 Those data come from 2008, and confirmed all-time record acreage planted in corn. I presume the trend is continuing. Those increased plantings are not to supply the sweet corn that I love. In Wisconsin, of the 3.9 million acres of corn planted in 2010, only 83,300 acres are sweet corn; that's about 1 acre in each 40. So the way I think of that field at the end of my road is that it has one acre of "eating'" corn, and 39 acres of corn for ethanol, polymers, cattle and hog feed, gluten, corn oil, high fructose corn syrup, and other products. Now when I look at a cornfield, what I see is not a scene of pastoral tranquility; I see a factory. I can't really say with any conviction that this is "wrong." It's just the way things are, and it reflects a reality that has changed during my lifetime. Others are not so sanguine about the changes; for an article by someone with practical experience in the corn business I would offer this letter from the Daily Yonder. Credit for the corn maze photo to Greg Dixon at Madison.com. The other two are mine. 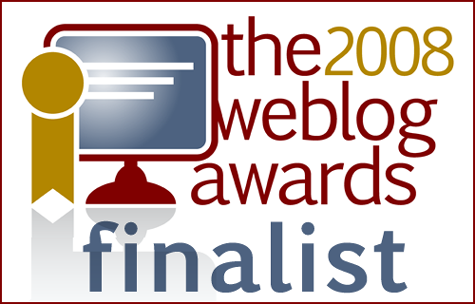 For related previous posts, enter "amelia" in the search box in the blog's right sidebar. 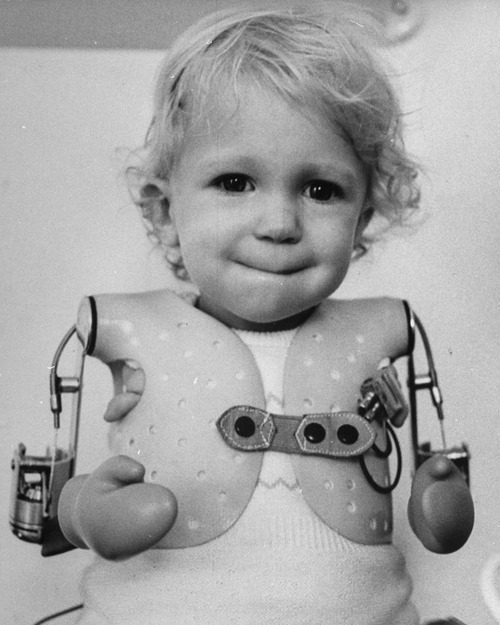 Other examples of the disorder are depicted in a thalidomide-related post at Lilliputrid. Photo via Old Photos, Young Kids; original credit Time Inc. / Stan Wayman, 1962. 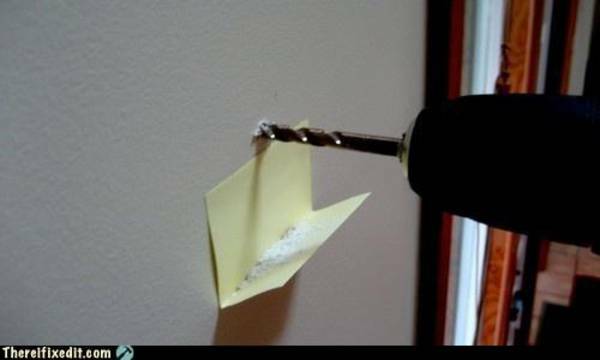 Place a folded Post-It note beneath the hole. 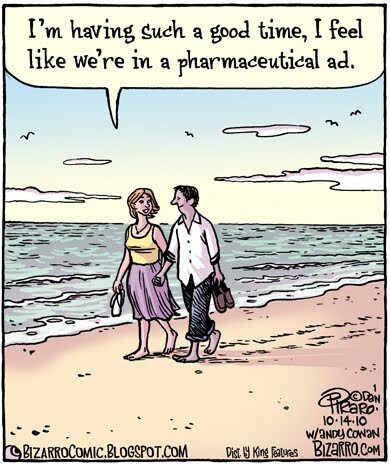 Via Boing Boing. For all the gazillions of dollars spent on health care in the U.S., overall life expectancy is considerably lower than in other Western countries. This discrepancy is often blamed on firearm and automobile deaths among younger people distorting the average life expectancy. The graph above shows the gradually improving life expectancy of men aged 65 around the world. Note that the U.S. (in red) is at the bottom of the group, and actually has been losing ground in the past couple decades. Found at Yglesias, where there is also an almost identical graph for women at age 65. (Photo deleted because when I originally wrote the post I linked to the London Salmagundi "via," not to the photographer, Kurt (OrionMystery). 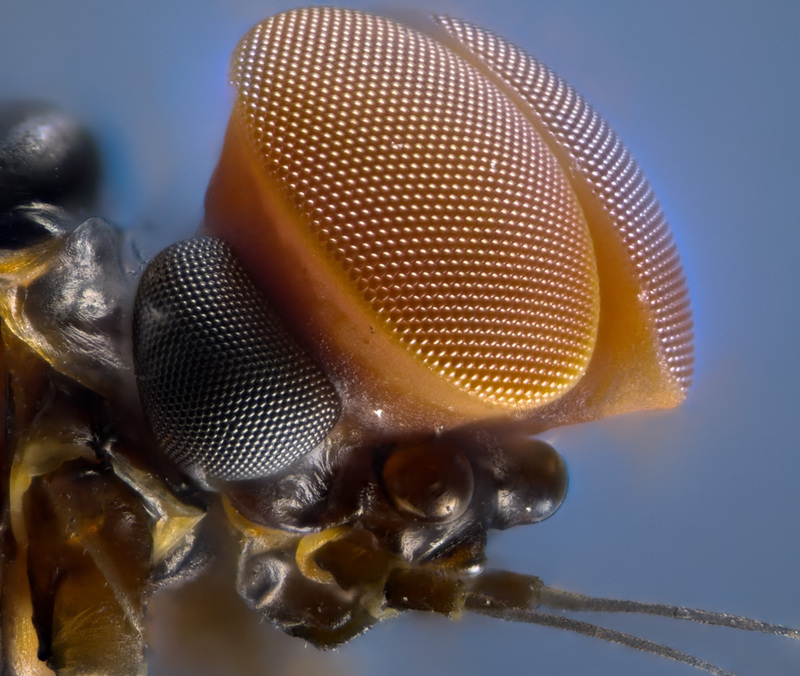 At the Not Exactly Rocket Science blog, Ed Yong discusses a paper in the Journal of Zoology which found that assassin bugs covered with dead ants were less likely to be attacked by spiders. Jackson and Pollard suggests that the ants break up the bug’s form so that instead of a characteristic shape that the spider can tag as ‘prey’, it sees a jumbled mess that doesn’t look like anything it has ever eaten before. It sees the bug, but doesn’t register it as a meal. An alternative hypothesis would be that spiders can sense formic acid or other toxins in the ant carcasses. One of the bookmarks that's been sitting in my "things to blog" folder is a video of David Garrett entering the Guiness Book of World Records by playing "Flight of the Bumblebee" in 1 minute, 5.26 seconds. That's the video at the top. Later Ben Lee beat David Garrett's record, with a time of 64.21 seconds. Today I read at Arbroath that that record has now fallen. Oliver Lewis, playing before a BBC audience (and a Guiness rep) finished in 1 minute, 3.356 seconds (second video above). If you have a reasonable skill timing your clicking on the "play" and "pause" buttons, you can get these guys to play the piece simultaneously. "It's really wet," said Anthony Colaprete, co-author of one of the Science papers... He and his colleagues estimate that 5.6% of the total mass of the targeted lunar crater's soil consists of water ice. In other words, 2,200 pounds of moon dirt would yield a dozen gallons of water. 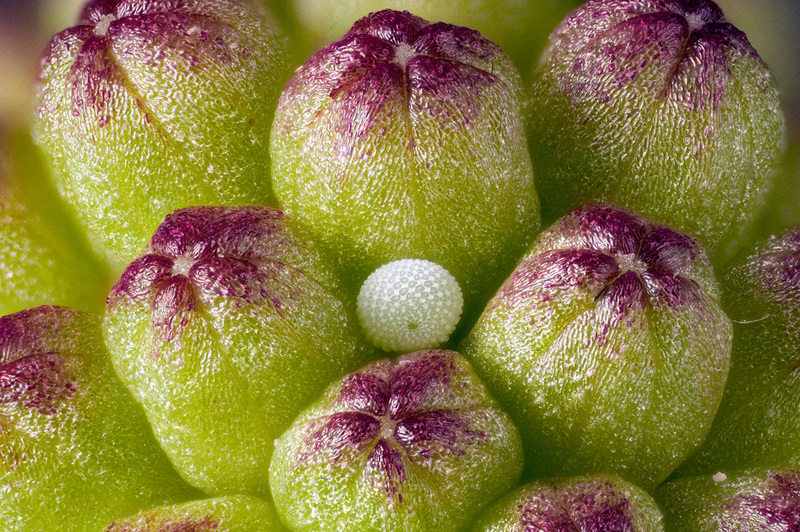 The scientists also found molecular hydrogen in the soil. "That's interesting because if you want to make rocket fuel you could heat up the soil and hydrogen would come pouring out," said Dr. Gladstone. Further details at the Wall Street Journal. I have featured "postmortem photographs" several times (here, here, here, and here). 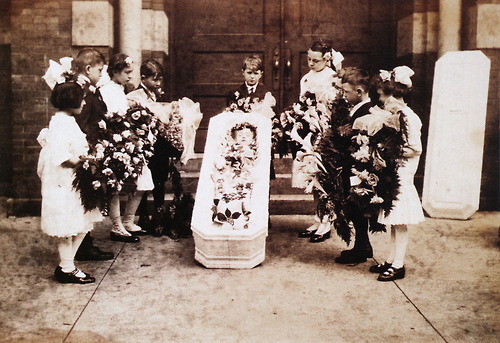 The one above from 1910 is a bit different in that it features the deceased posed with classmates rather than family. How do you cut this pie? The pie chart comes from an op-ed piece at the Washington Examiner. Even if you were to eliminate this entire slice of the budget (meaning you're willing to gut the Department of Homeland Security and defund all other federal agencies and departments) it wouldn't even eliminate half of last year's deficit. 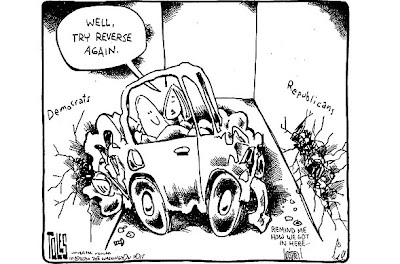 So, who's going to raise taxes and cut our spending on welfare, retirement benefits, education, and the war machine? This week the Chronicle of Higher Education offered the chart above and asked "why did these people go to college?" The article offers one viewpoint on a complicated issue; personally I think it's a rather narrow-minded viewpoint at that. There are some thoughtful and well-informed counterpoints presented in the responses to the article. A painting by Edouard-Louis Dubufe, which I thought had quite a bizarre composition until I read the biography of the lady, and discovered that she achieved her fame as a painter of animals. It's still a bizarre image, but at least now it makes more sense. "I always dreaded the prospect of trying to get the gunk of sticky flour or melted cheese out of a sponge or brush until I recently discovered a solution in the form of the netting that onions and other vegetables come packaged in. By cutting up the stiff netting bags from packaging into about 6" squares you can make reusable super scrubbing tools. A few bags will produce more than you'll need. Now when you're finished scrubbing you can toss or recycle the used nettin..."
Just put a dish of marshmallows or chocolate chips in the microwave, and then follow the instructions at Orbiting Frog or Kitchen Science Experiments. "When Darth Vader (David Prowse) revealed his secret to Luke, Hamill was hanging onto a pinnacle above mattresses placed on cardboard boxes about 30 feet off the ground." From a photo set at Vanity Fair. 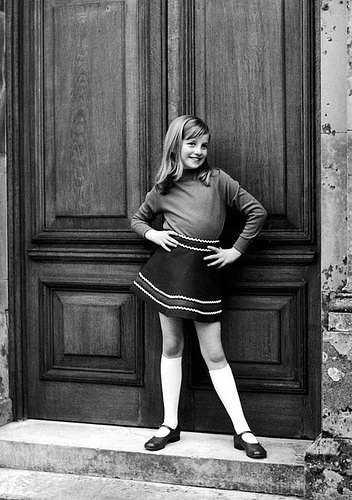 Do you recognize this pretty little girl? From Ready, Willing, and﻿ Able (1937), via I Like Riddles. Meatloaf + flat noodles + two olives. Directions at Gather and Nest, via Boing Boing. Found at Titam et le Sirop d'Erable. Via The Armchair Reader... and Lulu of the Zulu Nation. Credit: Prakash Mathema/Agence France-Presse/Getty Images, via the WSJ Photo Journal. 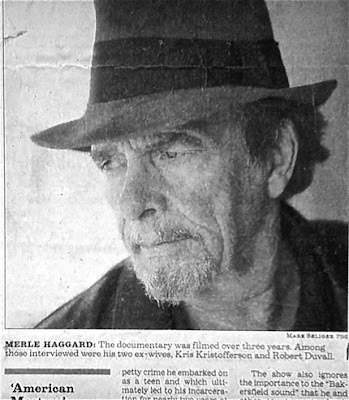 A photo from the archives of LIFE.com, with their caption. In 1883, Sitting Bull was a guest of honor at the opening ceremonies for the Northern Pacific Railroad. When it was his turn to speak, he said in the Lakota language, ‘I hate all white people. You are thieves and liars. You have taken away our land and made us outcasts.’ A quick-thinking interpreter told the crowd the chief was happy to be there and that he looked forward to peace and prosperity with the white people. Sitting Bull received a standing ovation. ...in the notorious eyeball-slicing scene... Buñuel claimed that he had used a dead calf’s eye. Through intense lighting, Buñuel attempted to make the furred face of the animal appear as human skin. As a long-time observer of "movie mistakes," I couldn't help noticing that the hand inserted through the door is a left hand with the palm toward the door, and the hand with the ants is a right hand with the palm toward the woman. 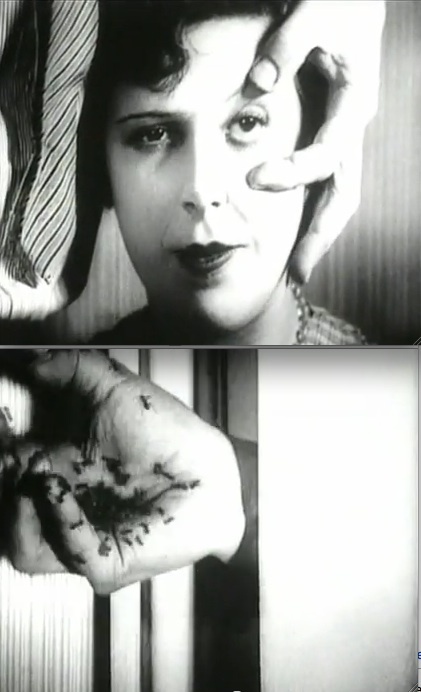 Eisenstein's 1925 silent film is embedded in its entirety above. If you don't have the requisite hour+ to view this classic, I posted the iconic Odessa Steps scene (and some related clips) last year. Amateur video filmed in Nanjing in the Ming Dynasty shipyard. 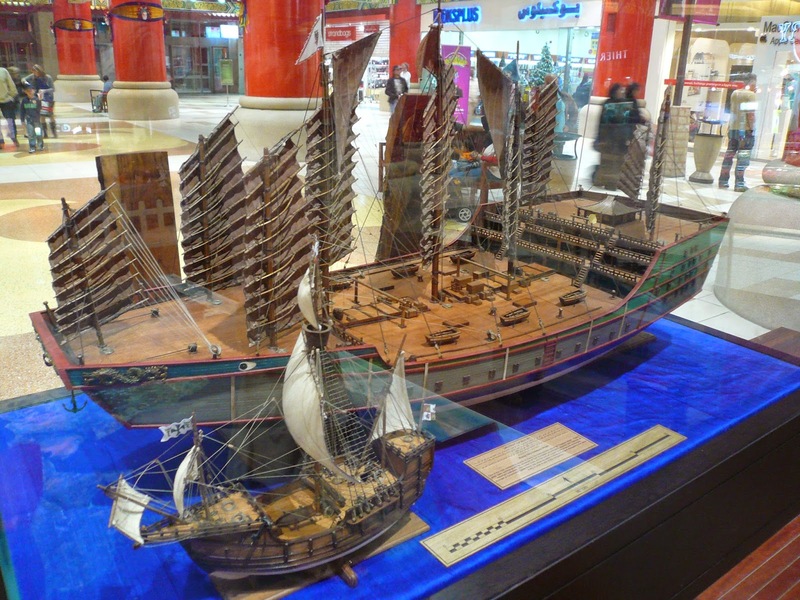 I have seen Zheng He's ship compared to Columbus' flagship in diagrams; this is the first time I have seen the contrast portrayed with models. "These coins were carried only by envoys of the emperor, Chengzu," Prof Qin said. "We're discovering that the Chinese had a very different approach from the Europeans to East Africa," said Herman Kiriama, the lead archaeologist from the National Museums of Kenya. "Because they came with gifts from the emperor, it shows they saw us as equals. It shows that Kenya was already a dynamic trading power with strong links to the outside world long before the Portuguese arrived," he said. And that is profoundly influencing the way Kenya is thinking about its current ties to the East. It implies that China has a much older trade relationship with the region than Europe, and that Beijing's very modern drive to open up trade with Africa may in fact be part of a far deeper tradition than anyone suspected. This stuck a chord with me because it was only yesterday that I bookmarked this story at The Daily Nation about how the Chinese are providing free health care to Africans via a floating hospital. Medical staff aboard the Chinese Navy hospital ship Peace Ark have been treating an average of 700 patients a day since last Thursday. The crew, which leaves the port of Mombasa tomorrow, has been doing an average of six operations, 80 physical examinations, 110 dental check-ups, 35 CT scans, 200 DR examinations, 240 ultra sound cases and 170 heart check-ups per day. The medical team also visited the Ziwani School for the deaf, Tom Mboya School for Cerebral Palsy, the Mji wa Salama Children’s home and did physical examination on 243 children, 30 of whom were taken to the ship for further treatment. The Peace Ark hospital has 428 medical and support staff. They include neurologists, surgeons, radiologists, dermatologists, biomedical engineers and psychologists. Other facilities are a rescue helicopter, 32 medical departments including Chinese herbal medicine, 300 hospital beds and a wide range of diagnostic medical equipment. These two articles reinforce the headline several years ago in the London Evening Standard: "How China's taking over Africa, and why the West should be VERY worried." Across Africa, the red flag of China is flying. Lucrative deals are being struck to buy its commodities - oil, platinum, gold and minerals. New embassies and air routes are opening up. The continent's new Chinese elite can be seen everywhere, shopping at their own expensive boutiques, driving Mercedes and BMW limousines, sending their children to exclusive private schools. "Stayin' Alive" + "The Wall"
How much water is in the meat you buy? "Go over and pet the camel, son..."
Are surgeons properly addressed as "Mister" ? ?